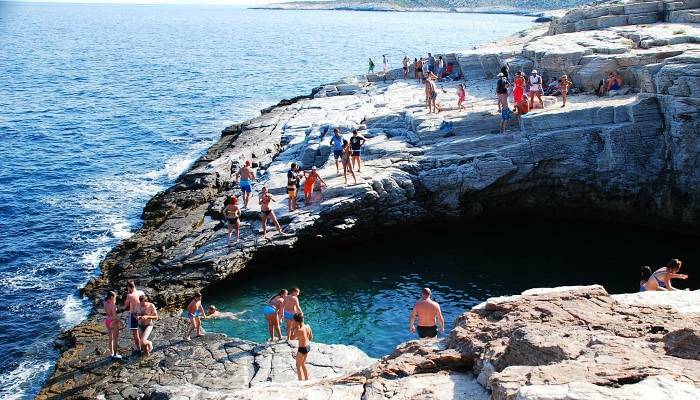 Located in the Eco-archeological Park Ik Kil, this beautifully rounded hole in the earth sinks around 85 feet from the surface, and steps have been created to help your descent. 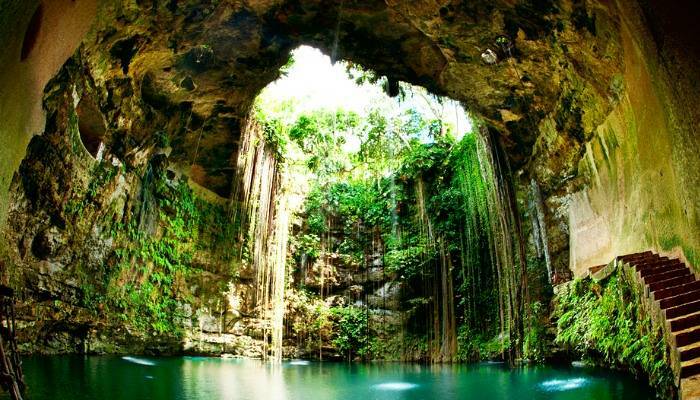 Supposedly blessed with magical qualities according to Mayan heritage, this impressive cenote with its jungle surrounds and flowing waterfalls certainly makes for an enchanting dip. They say that good things are worth waiting for and with a 12-hour hike on the cards, this is certainly the case when it comes to Havasu Falls. 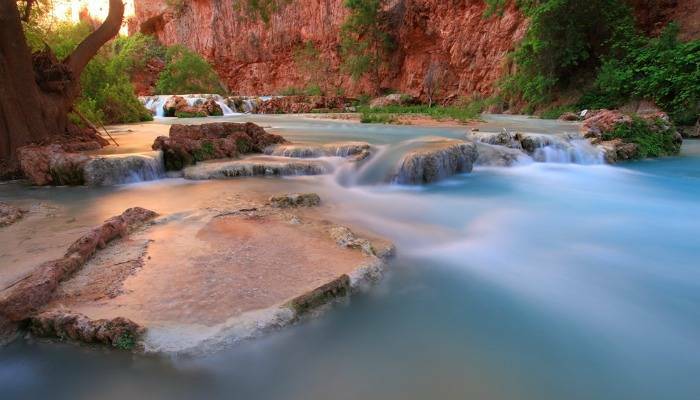 Often described as the hidden gem of the Grand Canyon by in-the-know travellers, this frothy waterfall with creamy turquoise waters makes the day of hiking all seem worthwhile. Plus, you can expect to see wild horses and blue herons on the way. With a relatively easy walk amid stark Scottish mountains, there’s no denying that these shallow green pools have a mystical presence about them. Go later in the day to avoid the crowds and be prepared to brave the cold – especially if you’re taking a dip! 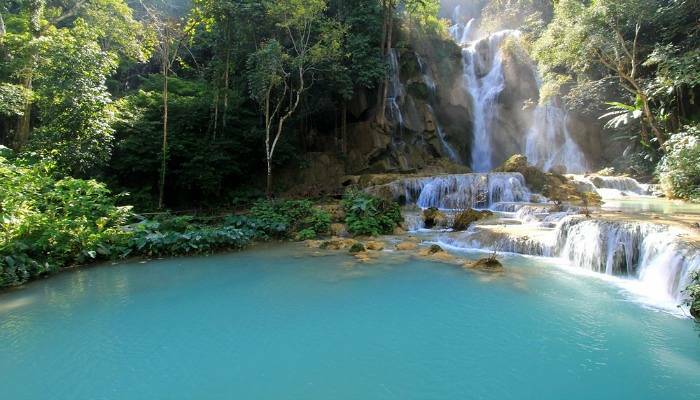 This three-tiered waterfall is easy to access and has tranquil green pools that provide a soothing respite from the Laotian sun. The journey there isn’t bad either; you’ll amble through rice paddies and villages where locals still don traditional dress. One of Iceland‘s must-sees, this popular tourist destination may get crowded, but it’s still well worth a visit. 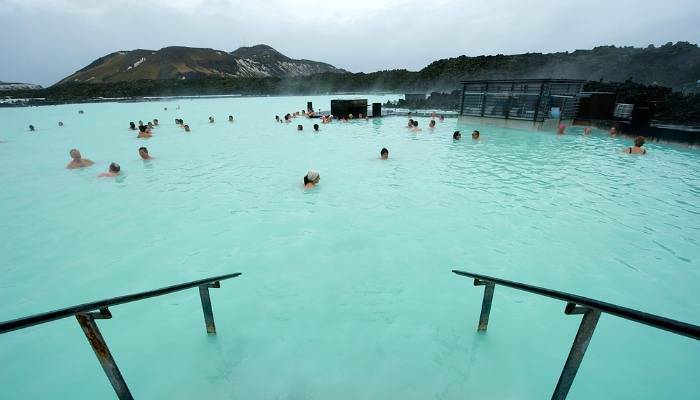 This year-round heated spa offers up steaming turquoise waters surrounded by lava fields and snow-capped mountains. The water is also abound with plenty of minerals including white silica mud, blue green algae and mineral salts – all said to have a positive effect on the mind, body and soul. 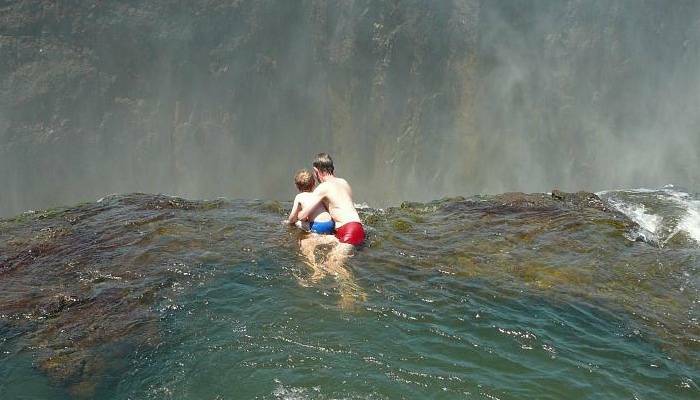 Located on the (very) edge of Victoria Falls, Devil’s Pool is only safe(ish) when the water is not high, and is definitely not for the faint-hearted. Between the months of May to October, brave tourists can carefully make their way to the edge of the rock pool that sits beside a 100 metre drop. Experienced guides will carefully navigate you – and happily reassure you that you won’t be swept over the edge! 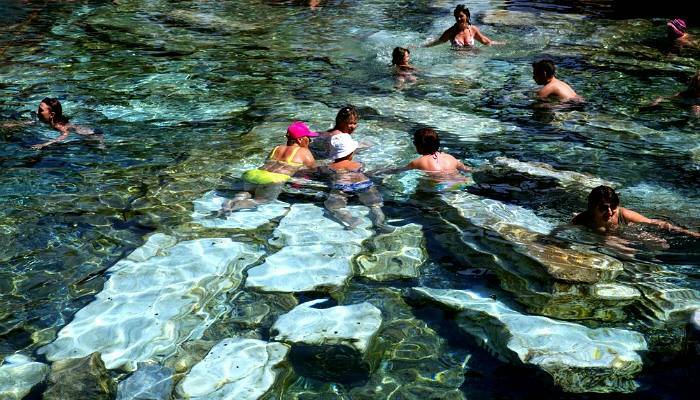 These hot springs are Turkey‘s most famous natural bathing spot. Known by locals as ‘Cotton Castle’ because of its fairytale-like structure, the calcium-laden waters have formed travertines filled with turquoise waters. There are plenty of spots to pick from, although an early morning trip is best if you want to avoid the crowds. If you want to experience The Antique Pool, which boasts marble columns from the Roman Temple of Apollo, entry is around £9. Located on the starkly beautiful Santa Cruz Island, this crevice between two cliffs opens up to reveal crystal-clear green waters that make for an idyllic dip. 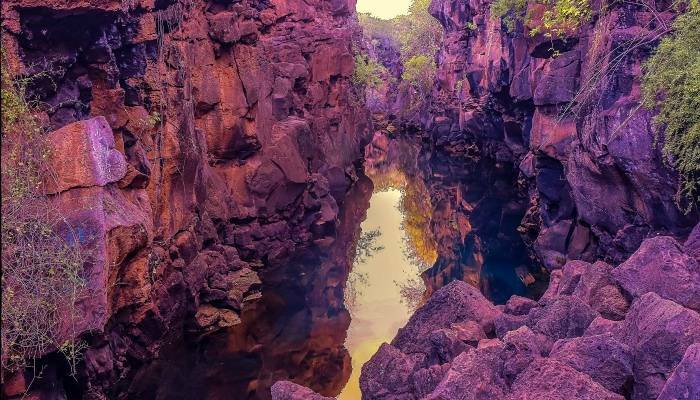 The spot can be reached via speedboat (just 60 cents), before embarking on a 15-minute trail across a lava field, a cactus forest and through sandy paths. Once you arrive narrow wooden steps will lead you into the water and if you’re adventurous enough there’s a metre-long underwater tunnel for you to swim through! This tempting lagoon in Thassos offers a carved out area in the rocks, right beside the ocean. The water is warmer and clearer than the sea beside it, making it lovely for swimming. Although the walk there across the cliffs can be challenging and good shoes are required, once there it’s safe to jump right in the deep pool – resulting in a lovely end to the hike!